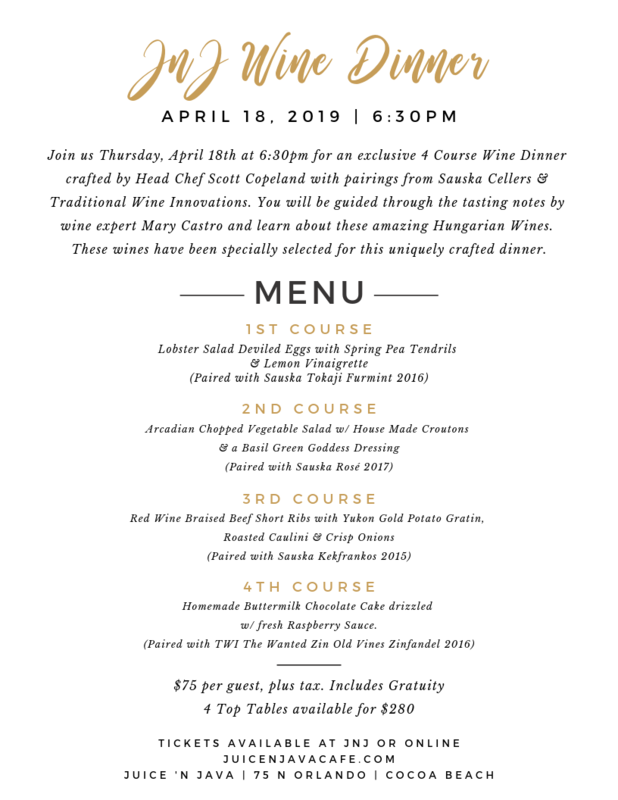 Join us Thursday, April 18th at 6:30pm for an exclusive 4 Course Wine Dinner crafted by Head Chef Scott Copeland with pairings from Sauska Cellers & Traditional Wine Innovations. You will be guided through the tasting notes by wine expert Mary Castro and learn about these amazing Hungarian Wines. These wines have been specially selected for this uniquely crafted dinner. Doors open at 6:00pm for a sampling of a specially selected sparkling wine. All wines are available for purchased by the glass or bottle. Flamenco Guitarist Shawn Foster will be performing live. His music combines a variety of flavors, from Flamenco to mild acoustic rock, and a bit of blues and combo of jazz fusion thrown in. Tickets can be purchased on Eventbrite or at Juice 'N Java.